Edna Maxine Wilson, age 79, of Edgewood, Illinois passed away at 1:18 p. m. Friday, February 1, 2019 at the Carle Foundation Hospital in Urbana, Illinois surrounded by her family. Graveside service will be at 11:00 a.m. Tuesday, February 5, 2019 at the Burge Cemetery in rural Farina. Pastor Bob Durre will be officiating. In lieu of flowers, memorials may go to Pagel Funeral Home or the donor’s choice. Edna was born on January 17, 1939 in Effingham County, Illinois to Lewis and Violet (Landreth) Yingst. She married Kenneth Wilson on November 26, 1956 in Edgewood, Illinois. 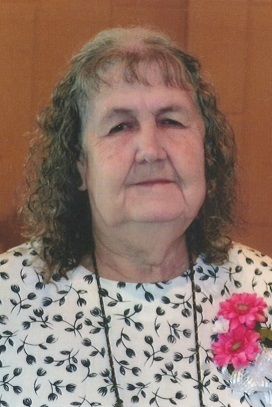 Edna was a homemaker who enjoyed working puzzles, crocheting, gardening, fishing, boating and spending time with family. She is survived by her four sons, Harry Wilson (wife Helen) of Iola, Illinois, Jim Wilson of Edgewood, Illinois, Bill Wilson (wife Sheri) of Edgewood, Illinois and Kenny Wilson of Edgewood, Illinois; one daughter, Kathy Peters (husband Charlie) of Effingham, Illinois; six brothers, Jim Yingst (wife Kay) of Farina, Illinois, Carl Yingst of Effingham, Illinois, Vic Yingst (wife Dee) of Edgewood, Illinois, Bob Yingst (Sarah) of Farina, Illinois, Dave Yingst (wife Christie) of Okaloosa, Illinois, Glen Yingst (wife Diane) of Louisville, Illinois; three sisters, Ruth Liska and Fern Hayes both of Mason, Illinois and Violet Lilley (husband Don) of Louisville, Illinois’ 16 grandchildren; 6 great grandchildren with one on the way. She was preceded in death by her parents, Lewis and Violet Yingst and her husband, Kenneth Wilson; 1 brother, Lewis Yingst Jr.; and four sisters, Laura Fehan, Betty Fancher, Ruby Caldwell and Emma Davis.